This is the signature product of the entire Culture of Appreciation project with the accompanying Facilitation Guide! 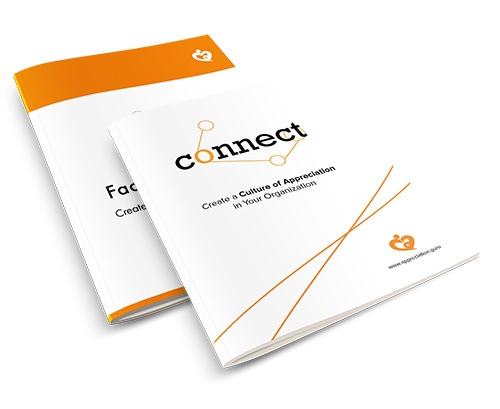 The 40-page Connect Book includes 52 activities that will get you started on your journey of creating a Culture of Appreciation in your organization. It gives you a deeper look into Culture of Appreciation, while providing activities you can implement immediately. Designed to help you select and match the type of appreciation activity that best fits everyone involved. Helps you reflect on how to implement new appreciation strategies. Includes pictures and images that visually assist in the learning process. The detailed 40-page Facilitation Guide supports you to apply 6 activities from the Connect Book to their fullest potential. It is a comprehensive supplement for people in organizations who are ready to actualize the Connect Book. Designed with pizazz and easy-to-follow directions. Gives you a thorough explanation of 6 activities with action steps and directives: Heart & Soul of the Month, Angel & Mortal, Back on Track, Tokens, Plateful of Praises, The Ripple Effect. Sections include: facilitator tips and tricks, timing suggestions, level of risk, materials list, variations, and – as appropriate – how to alter it for virtual use. Great for the beginner or experienced facilitator. You can choose the Connect Book and Facilitation Guide in US or British English – this is the US English version. The 40-page Connect Book includes 52 activities that will get you started on your journey of creating a Culture of Appreciation in your organization. The accompanying 40-page Facilitation Guide supports you to apply 6 activities from the Connect Book to their fullest potential. It is a comprehensive supplement for people in organizations who are ready to actualize the Connect Book.